Page 220 of the essential and indispensable book “Extra! Weegee” features a photo of a large, empty box. The photo (exactly like the photo below) is cluttered and claustrophobic, yet empty. Perhaps it’s a crime scene. There are boxes, cartons, a coat, and papers on top of the empty box and on shelves in the background, there’s a can or two on the ground; a pole and it’s shadow are in the foreground. “RECLUSE DIES IN COFFIN-LIKE BED. “Dies in Coffin in Which He Lived. “The mystery of Jeremiah Erranght, accurately nicknamed Dracula by a sharp-eyed East Side kid years ago… lived for 35 of his 55 years in a two-room flat at 79 Allen St… Yesterday police smashed down the door… and found him dead. Like Dracula, the king vampire of Bram Stoker’s creation, the recluse had almost literally dwelt in a coffin. 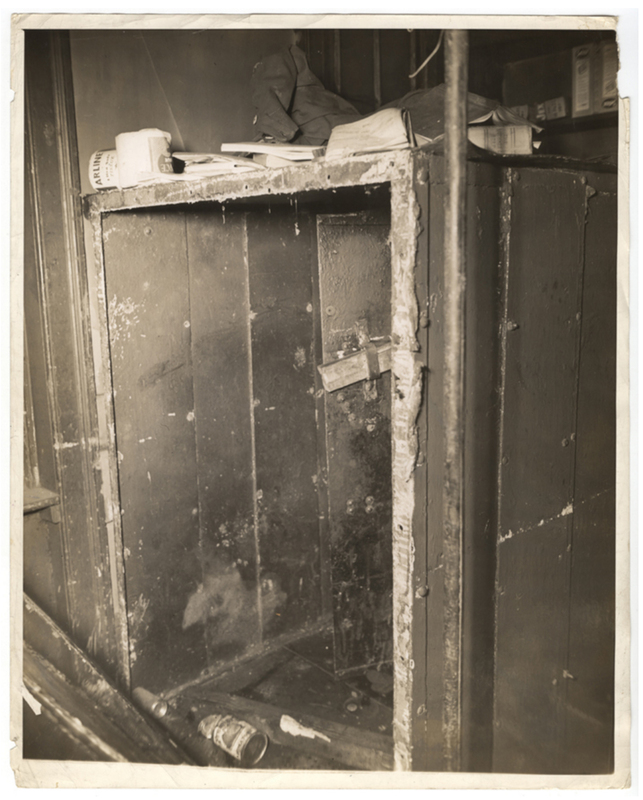 His six-foot length was found crammed in a four-foot-square sheet metal box, which he had built himself… its narrow door was padlocked on the inside. The body was clothed in trousers and undershirt, galoshes and earmuffs. There was no bedding in the box. AP: “…They broke into his unlighted and unheated room after neighbors reported him missing for several days and plowed through the trash-filled, furniture-less abode for half an hour before deciding to pry open the big box. 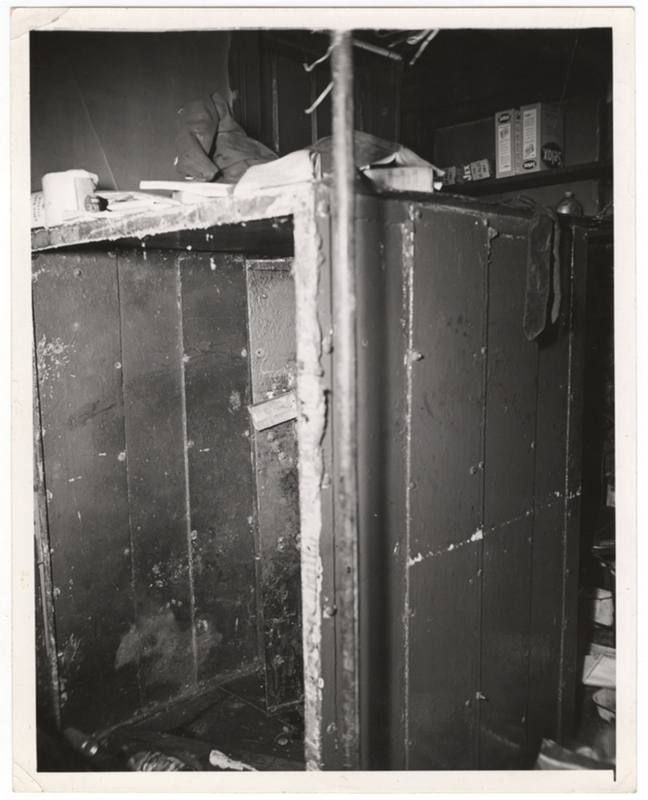 A taciturn six-footer whose long black cape and hat were a familiar sight on the East Side was found dead yesterday in a metal chamber that served as his bed in the two squalid rooms he had occupied for thirty-five years at 79 Allen Street. …alarmed at not having heard the heavy iron door clang shut at night, Siebert [the janitor who lived next door] called the police. His elongated figure garbed in a long black cape and wide black hat caused children to call him Dracula.